General elections are held every five (5) years. The next General Election is scheduled to be held in 2013. Applicants for the post of Standard Bearers were invited to submit application to their political party earlier this year. Inter-party elections have been held across the country. 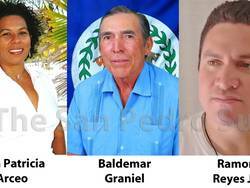 In the Belize Rural South (BRS) constituency (San Pedro and Caye Caulker), there were three individuals that applied for the post of Area Representatives for the People's United Party (PUP). Since there were more than one applicant, it is required that an internal PUP election be held in which supporters of the PUP determine which candidate is best to represent them in the next general election. The San Pedro Sun takes this opportunity to introduce the three candidates vying for the opportunity to represent the PUP in the BRS constituency in the upcoming 2013 General Election. We presented each candidate with seven questions and will continue to print their responses exactly as they were submitted. Q: Why do you believe that you would be the right candidate for the People's United Party (PUP) for Belize Rural South (BRS) Standard Bearer? A: For me to be able to represent the people of Belize Rural South once more would be an honor. I have a proven record of accomplished projects, progress and fulfilled promises. Along with many capable people of our islands, we were able to complete more than 85% of the local PUP manifesto when my party was elected to office between the 1998-2008 governments. I also bring with me the experience of a Cabinet Minister of State in the Ministry of Natural Resources & Environment. Some of the significant works that we were able to accomplish as the Standard Bearer includes the construction of the San Pablo Marina, New Police Station buildings, New Fire Station buildings and acquiring of fire trucks, New magistrate Court, New Social Security Building, Beach reclamation, DFC Housing Project, Distribution of over 2000 lots to island residents, New Parks & Playgrounds for our children, opening of new streets and installation of Lamp-posts, $3.6 Million for the Cobblestones, secure funds for New Water System for Caye Caulker and the building of the San Pedro High School auditorium just to name a few. All in all, there were 29 Projects in Caye Caulker and 29 Projects in San Pedro accomplished under my leadership and under a PUP government. Based on my track record we were able to accomplish and fulfill many promised projects that have benefited our islands. I am sure that people want to return to the days when our area had a working Area Representative. Given the fact that the current Area Rep has proven to be bewildered by his Ministerial portfolio, I am offering myself to be the candidate for the PUP Belize Rural South Standard Bearer so that together with the people we can rescue our islands. A: Because of my proven track record and integrity. A: I am the right Candidate as Standard Bearer for the PUP Belize Rural South Division because I'm the ONLY candidate that can Win and Lead the PUP to Victory in the next General Elections. The Promise of Real CHANGE, not just talk. The Promise of a New Vision, New Hope, a New Way!!! The People of Belize Rural South will have a Fresh Start, someone who will Truly work For and With the People of San Pedro and Caye Caulker. Q: We know that you have been a very active politician on both Ambergris Caye and Caye Caulker for years; however you were unsuccessful in the last General Election that you competed in. What makes you believe that you will make a formidable candidate against the two-term incumbent Hon. Manuel Heredia? A: No election is an easy election as they all bring their own challenges and momentum and becomes a learning experience for everyone. However, putting people first is and has always been my priority which has remained my focus in creating a better San Pedro & Caye Caulker. My people know they can "Count on Me," and it's a relationship that remains whether I am in or out of government. One of the biggest testaments to this is when I chose to weather two of the most devastating hurricanes, Mitch and Keith, along with my people. I know I am a formidable opponent based on the fact that our electorates are intelligent and our people can appreciate the differences between both parties and candidates, based on my track record of accomplished projects compared to that of the Hon. Manuel Heredia. Our party lost in 2003 but 2013 is going to be very different. My people are demanding an Area Rep like myself, that makes decision with them, and not always responding with the same old excuse of "I am taking issues to Cabinet", with no positive results which is used by our current Area Rep. A perfect example is the lack of concrete decision by the current Area Rep on the issue of Oil Exploration/Drilling next to our Barrier Reef System which is the backbone of our islands economy. A: First of all every body knows why we lost the elections. Since nobody wanted to stand for the party as a good PUP I did even thou I knew it was difficult to win. Q: What makes you believe that you will make a formidable candidate against the two-term incumbent Hon. Manuel Heredia? A: The main reason that I became an aspirant for the PUP in Belize Rural South is to unseat Manuel Heredia Jr and the UDP. Minister Heredia has had his chance. Firstly, under the PUP between 2003 - 2008, and then he had excuses that his Government was not in power. Secondly, now he is under his UDP and still he is just not working for our islands. I know Mr. Heredia personally and respect his position. However, our islands need better Leadership, there is too much neglect. Our islands need a Long Term Plan that can maintain us through the hard times. A Plan to lower foreclosures of homes and businesses. A Plan that will create more Jobs and bring better income to our islands. Team Ramon and Ramon Reyes Jr have these Plans and can Lead San Pedro and Caye Caulker to greater things. We will consult, include, and listen to the People so we can fine tune these Plans and ensure that the People are truly included. Elections to select the PUP standard bearer for the BRS Constituency are scheduled for Sunday June 12, 2011. In San Pedro, the elections will take place at the Angel Nuñez Auditorium, from 9:00am - 5:00pm. The location for the Caye Caulker elections will be at the Caye Caulker Roman Catholic School between the hours of 9:00am - 5:00pm. All registered friends and supporters of the PUP in the BRS Constituency are invited to come out and support their candidate of choice. Please look to next week's issue of The San Pedro Sun for responses to more questions posed.